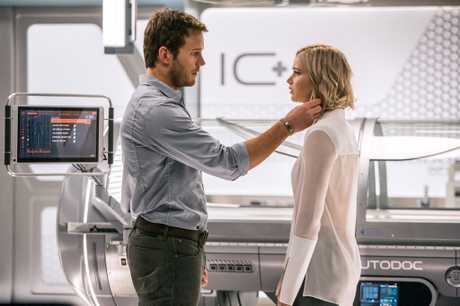 PASSENGERS is a sci-fi fantasy for those who are happy just to go along for the ride. The method of transport is superior, the man in charge of steering the (space) ship proficient, and the scenery arresting. 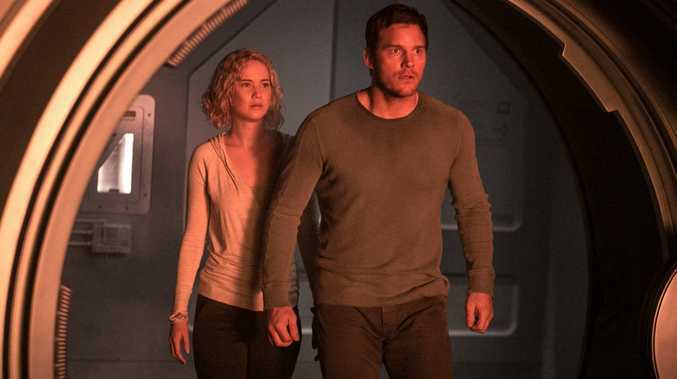 But while Chris Pratt and Jennifer Lawrence give Morten Tyldum's handsome intergalactic adventure everything they've got, the two resourceful leads can't overcome the limitations of the screenplay. There's a darker, deeper, more provocative story about human relationships bubbling away beneath the surface. Mechanical engineer Jim Preston (Pratt) is one of 5000 colonists travelling on the Starship Avalon to a planet that will take 120 years to reach. He wakes up from hibernation 90 years early due to a computer malfunction. Faced with a lifetime on his own in an empty spaceship with only Michael Sheen's relentlessly cheer robot bartender Arthur for company, Preston wakes up the woman of his dreams, Aurora Lane (Jennifer Lawrence), an ambitious journalist he feels he has come to know through her writing. Preston's actions might be understandable, in the circumstances, but they are certainly not excusable. The film doesn't entirely gloss over the ethical conundrum at its core. Pratt does his best to communicate the extent of Preston's internal struggle. And Lawrence is an actress capable of conveying the full impact of Lane's horror when she discovers what her fellow traveller has done. But the meaty moral dilemma is given a limited amount of screen time, functioning more as the regulation obstacle to the couple's blossoming relationship than an issue to be explored in its own right. To let their leading man/closet stalker off the hook, the filmmakers embark upon an escalating series of narrative twists and turns that provide the opportunity for some spectacular set pieces - the gravity-less swimming pool sequence, for example - but undercut the potency of the initial set-up. When it comes to exploring the big picture, space provides filmmakers with pretty much a blank canvas. The recently-released alien invasion film Arrival tackled existential questions about time, matter and human relationships. Passengers falls back on a bite-sized, embroidery sampler message along the lines of appreciating what you have got. Its needlework, however, can't be faulted. Stars: Jennifer Lawrence, Chris Pratt, Michael Sheen.